Due to the rain up north and cooler weather there appeared to be a window of opportunity to head further north than originally planned at this time of year so we headed north with the Flinders in our sights. 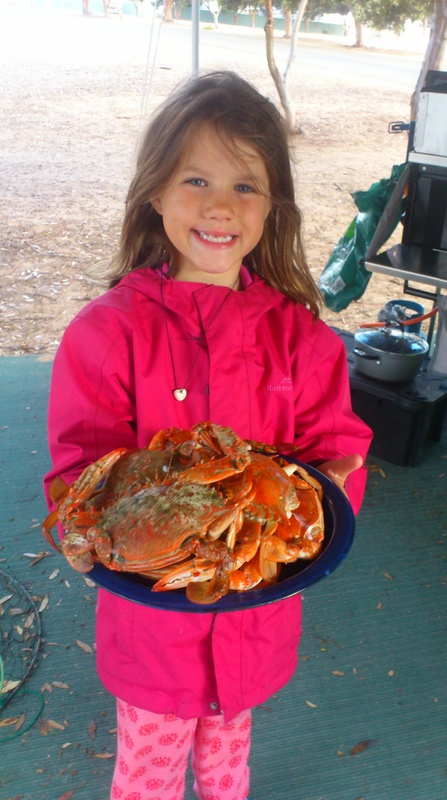 First stop Port Hughes, as the kids said they were keen to see the blue swimmer crabs that they had been told about. With raging winds keeping everyone away from the jetty, Xavier, Oscar and I braved the elements, armed with crab nets and carp for bait. Soon enough we had enough blue swimmer crabs for dinner and one bonus catch was a Port Jackson shark that came up with Oscar’s net. Next day saw us heading north for Wilpena Pound. Further north had just experienced 3 years worth of rain in 3 days so Amanda was stressing about going up there – I had started talking about doing the Oodnadatta Track by now as the outback with rain is spectacular as it initiates a new boom-bust cycle of life. Magnetic Hill was a necessary diversion on the way, according to many write-ups and first hand recommendations was a must see. Fifty Toes felt strangely drawn to Magnetic Hill but ended up a feeling a little let down. The optical illusion appears like the car should roll forwards, when in fact the hill takes you backwards. Thumbs down from us. Onwards to Wilpena Pound. Thanks AnaLuciaSilva. I’m a bit behind on posts but lots more great photos to come in next day or two!